Your chance to live out your dreams of driving a Formula 1 Grand car on track at Silverstone Circuit, the home of the British Grand Prix! This is without doubt an experience day that special person in your life, friends or those all important clients or your team will never forget. Feel the thrill of driving the legendary Silverstone track in one of the world's most exciting cars! The world's greatest driver get a serious kick from taking on the circuit's famous corners and straights, and you and your guests will receive instruction from the professional instructors on how to tackle them. 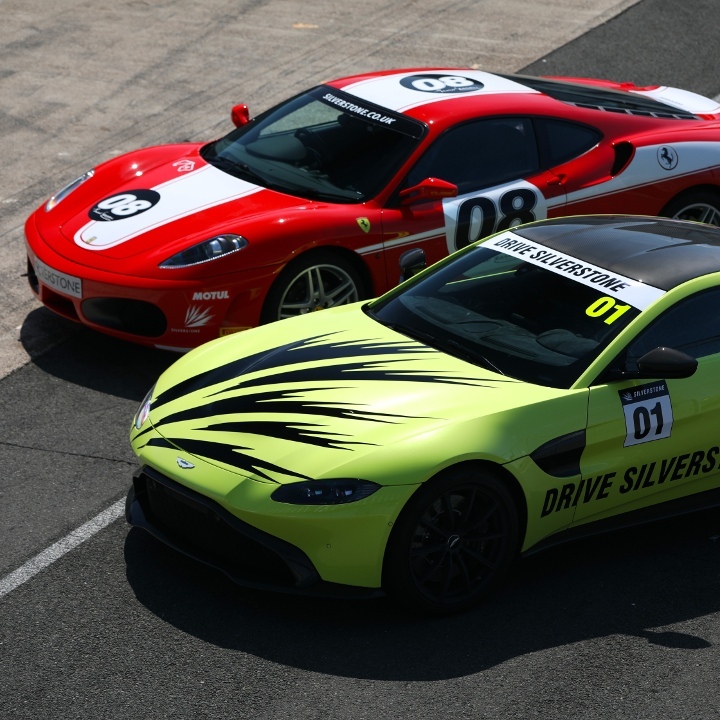 As well as the opportunity to drive a Formula 1 car we can also provide experiences to drive a range of other impressive cars including Ferrari supercars and the brand new Aston Martin Vantage & Caterhams. Packages start from as low as £95 + VAT per person, so we hope we can cater for all budgets. If however, your have a strict budget then please get in touch and we can work with you to arrange that special occasion within your limits. New for 2018 - This is the ultimate race car experience! Guests will learn your line in the BMW M2 before taking the Formula Silverstone single seater racing car out onto the track. You and your top guests will truly feel like a real racing driver for the day! The day will begin with being shown a demonstration lap from one of the circuit's professional driver followed by being taught the track's racing lines in a BMW M2. The it is time to put your new skills to the test and head out on to the track on your own in the Formula Silverstone Single-Seater car. This light, fast, aerodynamic racing cars have incredible grip and astonishing speed – you’ll never look at Formula 1® drivers the same way again. The experience lasts approximately 2 hours in total. Please note that there are restrictions that all participating guests must adhere to, please contact us for details. Packages are available from £275 + VAT per person. This is your chance to feel like a real Formula 1 driver as you experience 140bhp and 0-60mph in under five seconds in a lightweight, single seater Formula 1 style racing car. Sharpen your race-driving skills in one of the Formula Silverstone Single-Seaters. Enjoy incredible grip, steering and acceleration around the world-famous Stowe circuit. Settle in for a few laps behind the pace car, then you’re on your own. The experience lasts approximately 1.5 hours in total. Packages are available from £225 + VAT per person. Check out the video for this experience below. New for 2018 - This is the ultimate supercar experience. Guests will drive a BMW M2, Ferrari F430 Coupe and the brand new Aston Martin Vantage! Your experience will allow you to drive three exhilarating supercars at the Home of the British Grand Prix. You will be eased in gently with a demonstration lap from one of the professional instructors, before you are handed the keys to three of the most exciting supercars on the market right now. During this experience you’ll drive the a BMW M2, a Ferrari F430 Coupe and the brand new Aston Martin Vantage – once you’re done, you’ll be one of the few people who can argue which one is better! The experience lasts approximately 2.5 hours in total. Packages are available from £349 + VAT per person. Pitch the delightful squeal of the light, agile, 400 BHP Ferrari against the grace and power of the 4.3 litre, V8 Aston Martin. Enjoy the subtle (and not so subtle) differences in power, handling, dynamics and luxury refinement. Once your laps are done, you’ll be one of the lucky few who can genuinely settle the argument between the Ferrari and the Aston Martin. The experience lasts approximately hours in total. Feel the power of Ferrari on the UK’s only Formula 1 track! Slip behind the wheel of the 483 BHP V8 F430 Coupe, paddle through the gears, and scream out of Silverstone’s famous corners. Feel the hairs on the back of your neck stand up over two driving sessions in one of the world’s great cars. Introducing the newest addition to the Silverstone fleet; the brand new Aston Martin Vantage. The heart of the Vantage beats with a high powered 4.0 litre twin-turbocharged V8 engine, producing that visceral Aston Martin roar. The new left hand drive cockpit features a lower driving position creating a more immersive racing experience, intimately connecting you with the car and the track that lies ahead. It’s simply superb around the world-famous Formula 1 track. Get behind the wheel, learn the racing line, then unleash the power and push the Vantage to the limit. Ready to get behind the wheel of a 165bhp Caterham and put your drifting skills to the test? You will be eased in gently with a demo from a professional racing driver before you go it alone, challenge the drift course, and take on a challenger in a head-to-head race. The experience lasts approximately 1 hour 45 minutes in total. Packages are available from £149 + VAT per person. The choice is vast and can be tailored to your particular requirements, numbers of people and of course budget. Why don’t you book your own Driving Experience now? With over 40 years in the events industry we believe that we are in a good position to be able to formulate some great ideas for your future event requirements and would welcome an opportunity to show what we can do. Licence required? Yes, full UK manual driving licence for at least 1 year. This must be presented on the day.